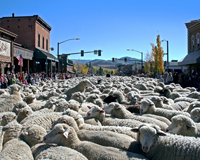 When hundreds of sheep are herded through Ketchum on Sunday, Oct. 12, their journey represents a tradition in the Wood River Valley more than 130 years old. Herds of sheep were first brought to graze in the valley in the 1880s. When the price of silver plummeted and mining operations were curtailed, the sheep industry, because of the abundance of rangeland in the valley, became a major economic staple. According to historian Sandra Hofferber, author of “A Pictorial Early History of the Wood River Valley,” by 1890 the local sheep population exceeded 600,000 animals. With progress came change. As the valley became more populated, as tourism became the major economic staple, and as grazing on public land became more regulated, the sheep population declined to about 15,000 animals per year, grazing on summer grasses and moving out of the valley before cold weather arrives. With the advent of time, agriculture has become more technical and mechanized. However, visitors—estimated at about 10,000—to the annual Trailing of the Sheep Festival parade will get to see it pretty much the way it was done 130 years ago, with a couple of herders, either mounted or driving a horse-drawn camp wagon, a few guard dogs and a band of hundreds of sheep. The band selected for this year’s parade is comprised of about 1,500 ewes. It is one of six bands owned by Faulkner Land and Livestock Co. of Gooding. Prior to the parade through Ketchum, the band is grazed north of Galena Summit in the Smiley Creek and Alturas Lake areas. They were herded there through late spring and early summer after grazing earlier at Twin Buttes southwest of Hagerman, near Bliss and at Macon Flats near Magic Reservoir. It takes about five days for the animals to be moved from north of Galena to Ketchum. Once there, the band is typically held near the Ketchum Cemetery until their noon appointment in town. “Usually, we’re there way before they’re ready to come into town,” said Jodie Faulkner, wife of John Faulkner and one of the owners of Faulkner Land and Livestock. Once through Ketchum, the band is herded south to Hailey, through Croy Canyon and south again to the Dietrich area. From the Dietrich area, the animals, along with other Faulkner bands, will be loaded on trucks and hauled for winter grazing to either Blythe, Calif., or Poston, Ariz. The bands are trucked back to Idaho in March to begin grazing again in the Hagerman and Bliss area before being herded again to the Wood River Valley. Lambs are typically born beginning in late December and they stay with the ewes until about July, when they are removed. At that time, rams are brought to the flock, about one per every hundred ewes, for breeding. While on rangelands, the sheep are protected by Akbash guard dogs, a breed that originated in western Turkey to protect livestock from wolves and other predators. Faulkner said there are typically three dogs per band of 1,500 sheep. Akbash are a large, lean, white animal, with males standing up to 34 inches tall and weighing up to 120 pounds. Faulkner said she and sheep ranchers were skeptical of the “trailing of the sheep” concept when it was masterminded 18 years ago by John and Diane Peavey, sheep ranchers who live northeast of Carey. This map shows the March-through-October route and grazing areas of the Faulkner Land and Livestock Co. sheep band that will be the stars in this year’s Trailing of the Sheep Festival parade.